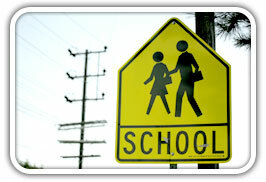 When entering a marked school zone, your foot should be covering the brake pedal and your eyes scanning the road. You know how kids can be: they’ll jump out of nowhere and run across the street when you least expect it. Regardless if it’s a school day or not, when children are in sight, school zones require you to follow the posted 25mph or slower speed limit. For example, if it’s a Saturday night at 10pm and you are in a school zone when kids are present (maybe a school dance just let out), you still need to adjust your speed and obey the slower school zone speed limit. When you slow down for children, you not only make yourself a safe driver, you also help alert other unaware drivers who may not see the obstacles you see. When they see you slowing down, their driving intuition will kick in and they will follow your safe-driving lead.